After over a month of non-stop travel, family visits, family functions, and one big road trip that took us all the way to the southern east coast, it feels great to be in one place long enough to work on this blog! In June, we spent a week in the Ft. Worth area and visited the botanical gardens and the Ft. Worth Zoo with the kids. Not long after that family trip, Evan and I dropped the kids off with some trusted family members and set out on a long drive in search of some (much needed) grown-up fun.This trip was pretty special to us as it was planned to be the honeymoon we never had after we were married a couple of years ago. We are so blessed to have family members who were willing and able to give us such an extended break. 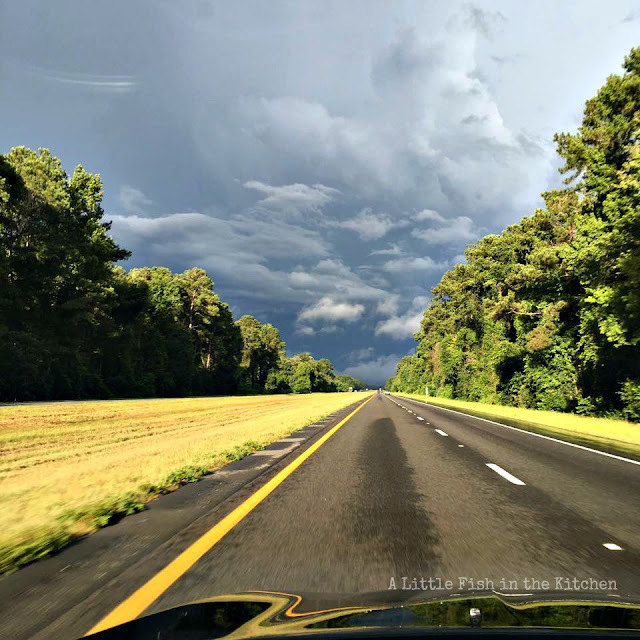 On our road trip, we saw miles and miles of beautiful country and got to stop and visit, albeit briefly, two destinations I've always been intrigued by: New Orleans, Lousiana and Savannah, Georgia! Our night in New Orleans was a flash in the pan, literally. We arrived after 8 hours of driving at 6 p.m., just enough time to clean up and head out for a couple of drinks and dinner. It was nearly dark when we got out and about and unfortunately, I don't have many pictures that are worth sharing from that night. But, I can say that our quick visit to the French Quarter and Bourbon street were, well, memorable. I enjoyed walking around those old sections of NOLA, and we sure had some colorful conversations with some interesting people during our brief stop. The next morning, we woke up early and had a delicious breakfast at a cool place called The Ruby Slipper. And, then we hit the road towards Savannah. Known for their original spins on Eggs Benedict, I had the combo plate a.k.a. the Peace-Maker. 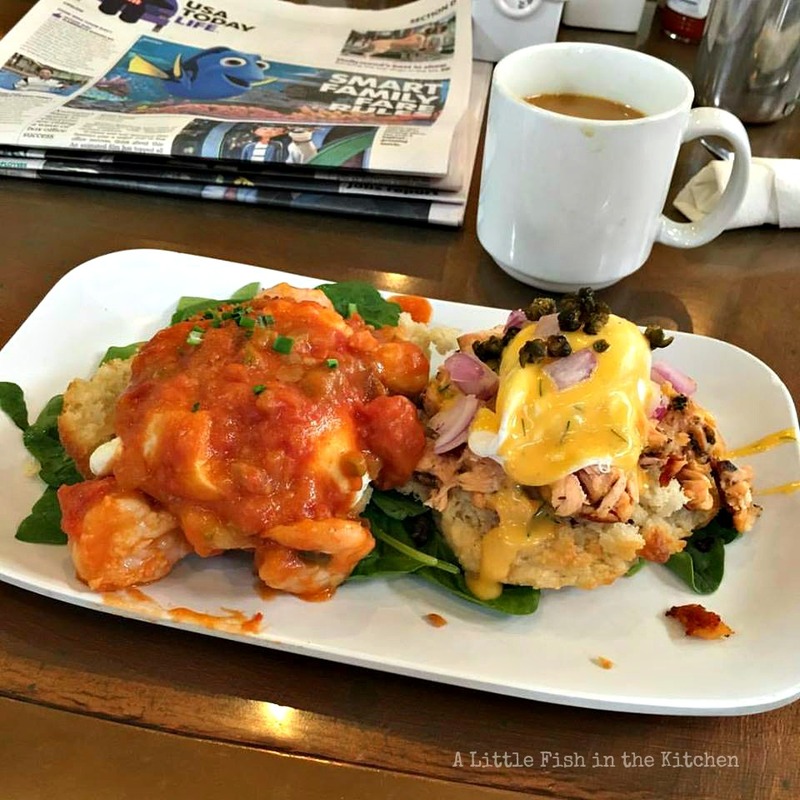 My Benedict was a split with one-half Shrimp Boogaloo and one-half Hot Smoked Salmon. I wasn't able to finish it, but it was a divine breakfast! I couldn't wait to get to Georgia! We made really good time and we were driving in the most perfect, sunny weather... until we hit central Florida. The weather was awful there that afternoon. We drove into intimidatingly dark skies, pouring rain, strong winds, and lots of thunder and lightening. Needless to say, we had to slow way down. The rain was so heavy at times we couldn't even see the road ahead of us. Even though we had a room booked in Savannah, it didn't seem like we would ever reach the Florida/Georgia line moving at such a snail's pace, and we seriously considered stopping for the night elsewhere. Picture I snapped when the sky had so much contrast as we were driving toward that Florida storm. Luckily, we finally got away from the storm and we arrived in Savannah that night, but much later than we planned. We hoped to be there in time to seek out a late dinner, but it was 11:30 p.m when we parked in front of our bed and breakfast. We were tired, but I was much too excited to go right sleep! 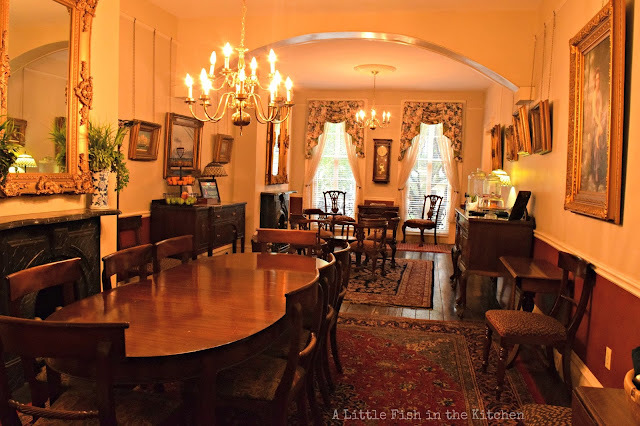 We stayed at the Savannah Bed and Breakfast Inn which is hosted in a row of beautiful, old town homes dating from 1853. It's located, smack dab, in the heart of the historic district downtown. We couldn't see much of our celebrated surroundings outside due to our late arrival, but I just had to take a few pictures of our room before we moved into it. The main dining room of the inn and our room were just so lovely. Our room was the "Mercer" room. It was a wonderful room, but the yellow paint mixed with the indoor lighting made for glowing nighttime pictures! Evan. Patiently waiting for me to stop taking photos. He wanted a cocktail after 11 hours of stressful driving! Throughout the next day, I was able to snap some photos from around the inn and it's surroundings. One of Savannah's 24 gorgeous, historic squares, Chatham Square, is located directly outside of the inn. 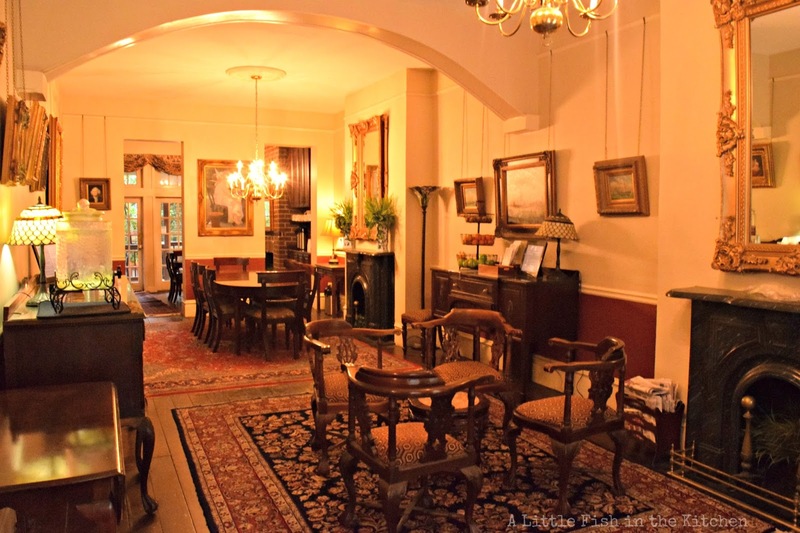 The main dining room of the inn. It was like stepping into another time! Same room from the other direction. We enjoyed the infused waters and chef-prepared sweets they left out on the buffet during the day. 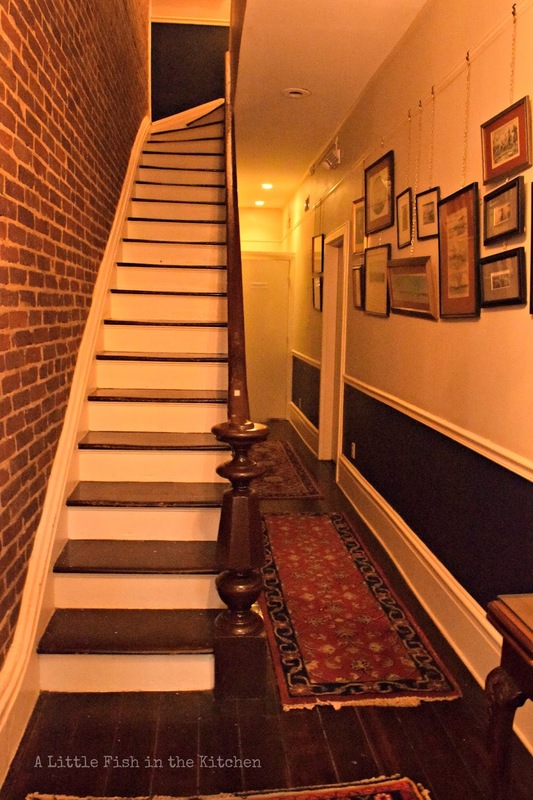 One of the cool, creaky stairwells heading up to rooms at the inn. They are a bit narrow and steep, but for me that added to the charm of our stay in such a gorgeous, old home. Green and lush, Chatham Square is directly across the street from the inn. Loved seeing this beautiful view first thing in the morning! The inn also has a beautiful private courtyard and large deck in the rear of the building where guests can go to relax or eat. We enjoyed the outdoor space very much, in fact we ate our breakfast on the deck each morning and relaxed with at least one cocktail there each evening. It was only after we were home in Texas that I realized I hadn't taken any photos of the courtyard. I did, however, take this video meant to capture another impressive thunderstorm that started on our last day there. We returned to the inn just minutes before the sky opened up with all this pouring rain. We felt fortunate to have gotten in several hours of sight-seeing before the storm set on. Now, I feel fortunate that I decided to take this impromptu video of the deck and courtyard. And then, of course, there was the amazing food! It is a bed and breakfast, afterall. Breakfast orders are placed the night before in the dining room and then made to order each morning by their talented, friendly, head chef Courtney Davis. He was kind enough to meet me briefly and let me snap his picture during a busy part of the morning. Savannah Bed and Breakfast Inn's Head Chef, Courtney Davis. Our height difference may be a bit noticeable in this picture. Yes, I was standing up. Wonderful morning meals served by the very kind staff at the inn. On the breakfast menu, we chose between a traditional egg breakfast, a healthy-choice yogurt parfait with homemade granola, or the chef's special which was different each day. 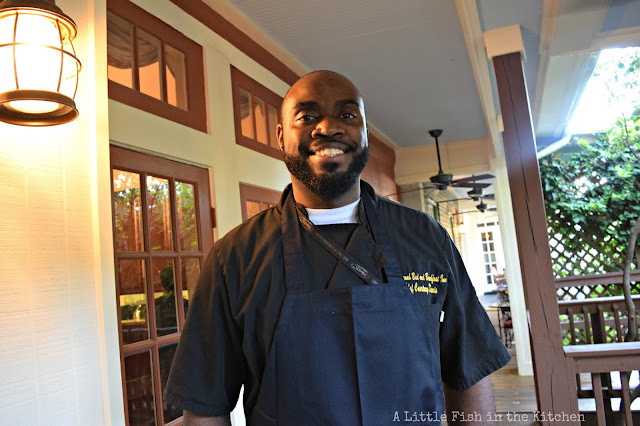 On the first and second mornings, I had the chef's specials which were, respectively, shrimp and grits and strawberry crepes. On our third and final morning, I had the yogurt parfait with that delicious homemade granola. I just had to pick the menu's healthy choice item for the last day there. Something light was necessary as we were about get back in the car for several hours. 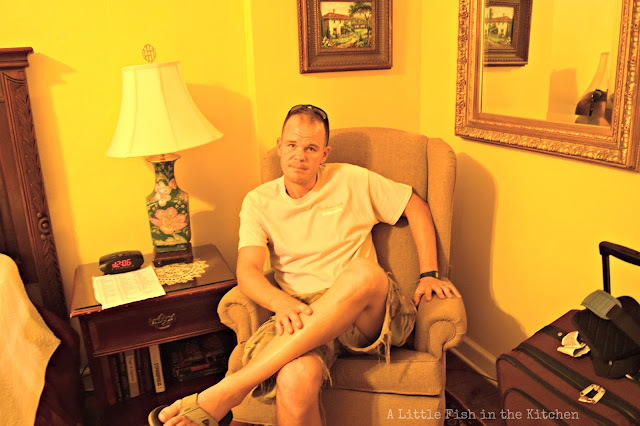 All in all, it was a really indulgent trip and in every sense of the word, I was rolling out of Savannah that day! I thoroughly enjoyed our meal each morning, but I've got to specifically address those shrimp and grits... they were to die for! Evan's face still lights up when I mention "the shrimp and grits we had for breakfast". Each morning our breakfast order was placed for an earlier time than the previous day, it's an understatement to say we were excited to eat! 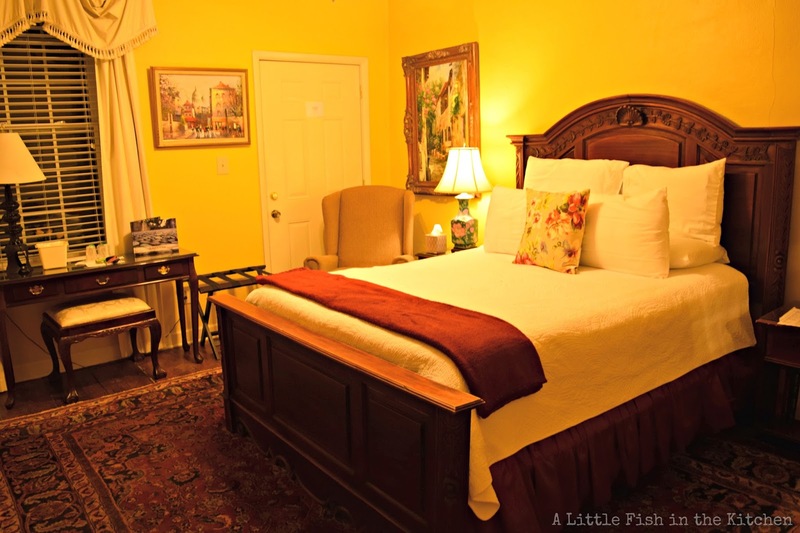 We felt so at home at the Savannah Bed and Breakfast Inn, we will definitely be back. 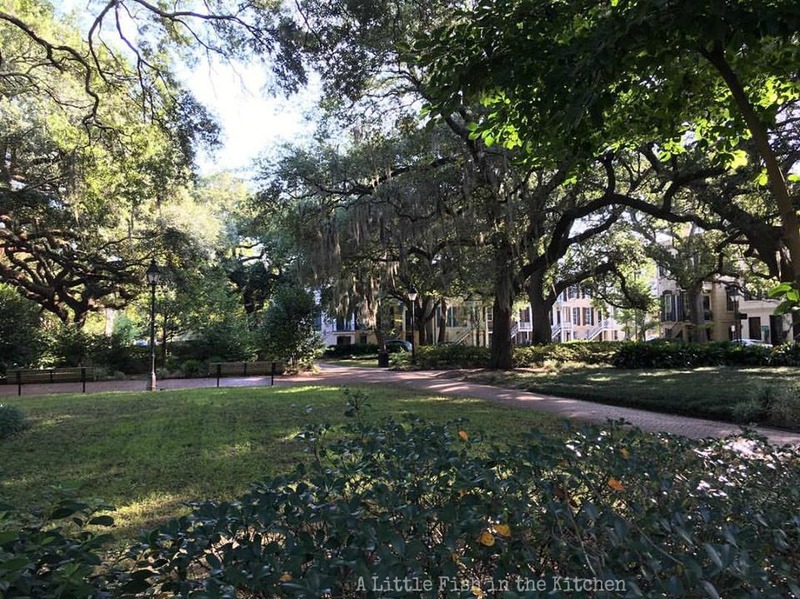 In addition to the hearty, delicious breakfasts we enjoyed at the inn, we pretty much ate and drank our way through the rest of downtown Savannah too. Visitors are allowed to walk around on the streets with alcoholic beverages served in plastic cups, i.e. "to-go" cups. To-go cups with any kind of beverage can be purchased in every establishment. Fortunately, the historic district there is built for walking, so we got in lots of daily exercise to, at least partially, offset all of our amazing dining and drinking adventures. I snapped so many pictures and we squeezed so much sight-seeing into our 48 hour visit to this city, I felt it was easiest to break this up into two posts...plus I need to finish sorting through the bazillion pictures I took while we were out walking around. 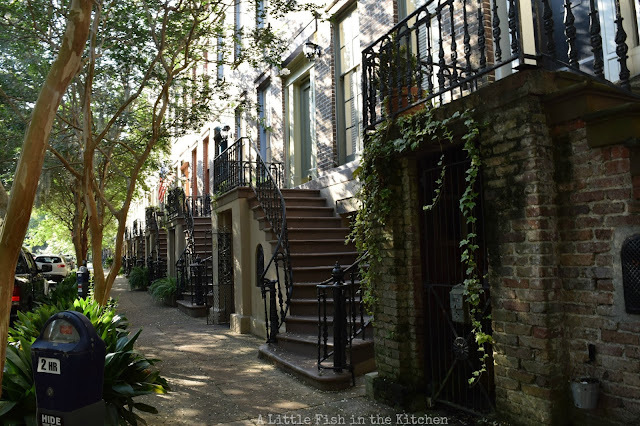 We walked through several gorgeous parks, stood on historic landmarks, strolled down cobblestone streets and we fell in love with each row of beautiful, historic homes we passed (yes, all with to-go cups in hand!). So, Part II is coming up soon... The sights we saw in Savannah! You have been busy :-)) and definitely had a great time, Marcelle. And wow...heavy rain! Wow, you've been doing some travel! Love all the pictures -- so much fun. I've been to Savannah once -- loved it, and would like to get back sometime. Anyway, thanks for the fun read! 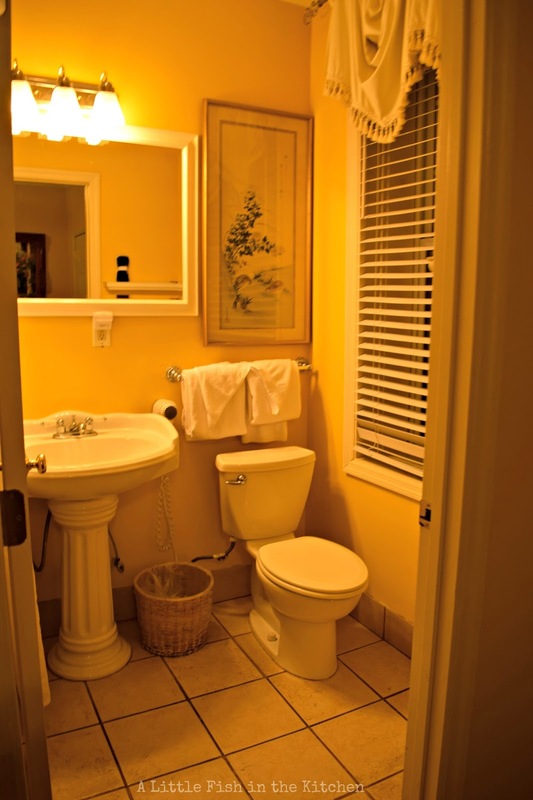 Hi Cheri, I've always wanted to visit Savannah and it was an exciting trip for me. Evan had been there a couple of times before :) I took so many pics! Thank you! i LOVE savannah and hope to revisit soon! it seems to me like you took full advantage of all it has to offer! What a wonderful trip! And lovely photos, too! I can't wait to see your next post. Savannah is on my must-see list and I loved reading about the inn you stayed at!